The VSSpeechSynthesizer is the text to speech API in the private VoiceServices framework for IPhone OS 4.0. Appearently, it only available for IPhone 3GS or above. As the VoiceServices is not a public framework, application that is dependent on it may not be allow to publish to Apple appstore. 1. Create the VSSpeechSynthesizer.h file and add it into the project. 2. 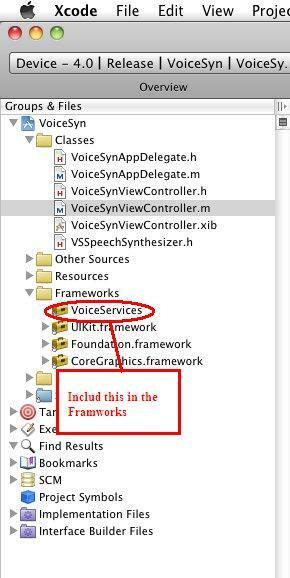 Create and initiate the VSSpeechSynthesizer object in the appropiate area of the code. 3. Adjust the pitch, rate or volume accordingly. 4. Create the speech in the appropiate area of the code. *Note: The VoiceServies framework only available in the iPhoneOS platform, hence it can only build and run on the actual iPhone device. It can not be run and test on the simulator. I've downloaded your sample project and installed it on my iPhone 4. The app loads fine, but it doesn't speak. Just for the record, I'm an idiot, it works perfect. Volume was down. Thank you so much. My son doesn't speak and I'm not a fan of the available "talker" apps for children. So I'm writing my own app for him. I used your sample code and it works great. You don't happen to know if there is any way to change the voice to sound like a male speaker instead? Hi, I tried to build this into a sample app, but can't seem to get it to speak. Can you repost your Sample Project.zip, as it's no longer available. Thanks.